Hot melt adhesives and applicators for use in the foundry industry. 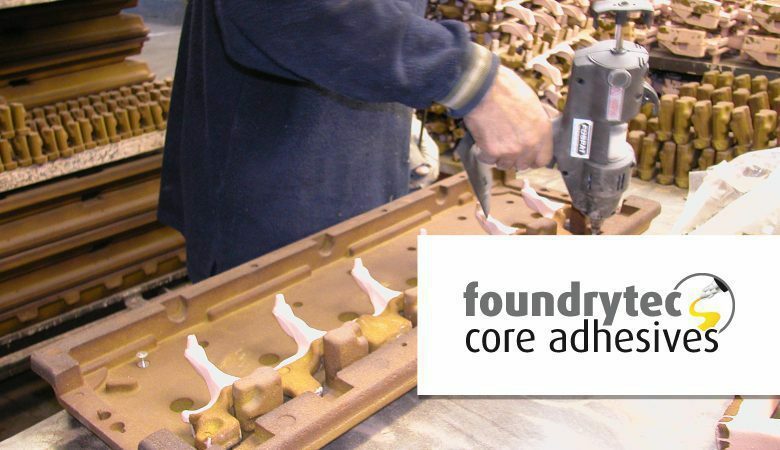 We offer a range of specially formulated foundry core adhesives under the foundrytec brand, designed to help speed up production times while maintaining the same level of quality, or greater. Excellent adhesion is granted where cold processes are used, such as ‘Cold Box’, ‘Alpha Set’ and ‘Beta Set’, allowing an almost instant bond. Our foundry core adhesives can also be applied to ‘Warm Box’, ‘Hot Box’ and ‘Shell’ processes, but these have to be cooled before the application can be made. The speed in which foundrytec applications can be made, and set mean that foundry core production times can be greatly increased, with our special formulation hot melts there is hardly any waiting for the bond to set. Foundrytec foundry core adhesive improves accuracy, while decreasing the amount of storage space required to house the equipment and with an everlasting shelf life, there’s no risk of our products expiring and becoming unusable.